The Cathedral Choir is about to introduce a new CD. That sounds as if we do this often; we do not. Our first and only other CD was recorded about 25 years ago. This new one is a recording of African-American spirituals arranged by Harry T. Burleigh. So why would the Cathedral Choir make a recording of African-American spirituals? For us at the Cathedral of St Paul, it was quite simple: we wanted to bring the music and life story of this most remarkable man to the people of Erie, the diocese and beyond. It is our way of “living history” and making it relevant in contemporary time. Spirituals are a significant part of American choral literature. The melodies are true American folk songs, passed on by oral tradition. Burleigh’s arrangements transformed the simple melodies he learned from his grandfather on the streets of Erie into classic art songs and choral works using his distinctively American harmonic language. Some are quite jazzy! His music is especially important to us at the Cathedral of St Paul because of his connection to Erie and our church. We have continued to learn more and more of his arrangements. Some are fairly simple and some are quite difficult. Following the celebration of the Cathedral’s Centennial a few years ago, we were encouraged to make a recording of his music. I was a bit hesitant to take on such a project. Singing live is one thing; recording is quite another. Live performances bring his music to life but in order to share it with a broader audience, we needed to record it. And there was no better time or place to do it: we have an exceptional group of singers right now and we are in the very place where Burleigh first sang as a young boy and teenager. He received the sacraments at St Paul’s and his musical foundation was formed in this building. It just seemed right to move forward with the project. We hired a local company and spent two days in March recording. Over the next several months I worked with him on finding the best takes of the choir and soloists and came up with our final product. Many hours were also spent finalizing the design and information to be included on the cover. But we expect delivery of the final product this week! That bring us to the release of the CD, Hold On! Keep Your Hand on the Plow. 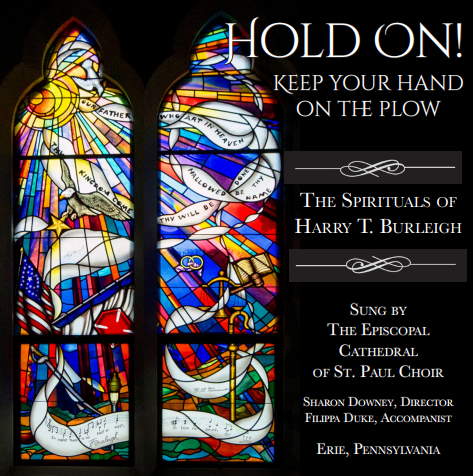 On Sunday, November 5, at 4:00 PM, the Sunday following All Saints’ Day, we’ll commemorate the life of Harry T. Burleigh with a traditional Choral Evensong followed by the singing of some of his spirituals and an opportunity to purchase the CD. There will be a festive reception, and more Burleigh spirituals, as well as an art display by one of our choir men, Jon Chisholm. He has donated several of his works of art for silent auction the proceeds going to help with expenses of the choir’s trip to England next summer. I am thankful for the encouragement and gifts from the Cathedral Chapter and members of the Cathedral of St Paul that made the production of this CD possible. Special thanks to AJ Noyes for the cover design and to Jim Steadman for the cover photo. And I am incredibly grateful for the Cathedral Choir, their countless hours of rehearsal and their devotion to bringing this music to life for all to enjoy. This entry was posted in Cathedral, Events and tagged Cathedral, Harry T Burleigh, Music, Sharon downey, spirituals. Bookmark the permalink.